There are a lot of misconceptions around healthy eating. You can't eat your favourite foods, you can't eat this or that, the food is bland and boring, you have to eat vegetables all the time, you can never have cake, it's a diet. Stop right there. You know what? To me, none of that is healthy eating. To me healthy eating is about enjoying foods that nourish your body, give you the nutrients you need, make you feel good, make you perform at your best - and those foods taste really, really good. To me, healthy eating isn't a diet - it's a lifestyle. Sure, I love vegetables and I eat whole grains - but I love a little bit of chocolate here and there and you'll never see me cutting out sugar or whole food groups or following fad diet plans - it's all about healthy balance. To me, healthy eating is reaaaaaaaallyy delicious - and I want it to be the same for you. I'm passionate about showing my family, friends and those of you reading Southern In-Law that healthy food tastes incredible. Jesse was stubborn and told me he'd never like healthy food - but it's safe to say I have certainly proved him wrong. Whether it's Chicken and Bacon Rice Bowls, Noodle Stir Fries, Healthy Chocolate Cake or this Chilli - the boy eats well and he never has to suffer through a meal. So even if your man is the fussiest eater of them all, all you have to do is make sure you leave out the healthy word - and they'll be happy as a pig in mud. And when you serve it with Healthy Cornbread - even the fussiest Southern man will be happy. In a medium saucepan, brown off your mince. Depending on that fat content in your mince, you may need to drain off some of the fat - do this by carefully and gently pouring it out into the sink whilst the water is running. Once your mince has browned, set it aside in a clean bowl. Brown off your onions with 1 tbsp of water, allowing them to soften before adding in your spices and garlic. Add your mince back into the pot and stir to combine with the onion mix. Add in your tomatoes, tomato paste and beef stock powder and stir until mixed through. Bring your chilli to the boil before adding your bay leaf, covering and reducing to a low simmer. Simmer your chilli, stirring occaisonally, for about 30 minutes to an hour or until it is thick and flavoursome. 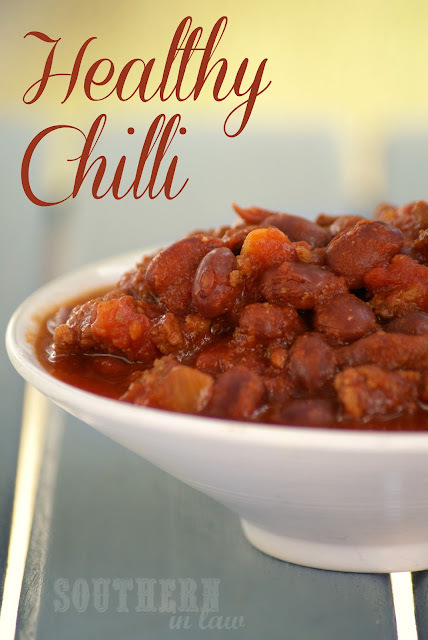 If you like your chilli thinner, add in some boiling water until it reaches your desired consistency - or if you like it thicker, allow it to continue to thicken for a while longer. Serve immediately or allow to cool before freezing for a quick meal or storing in the fridge. 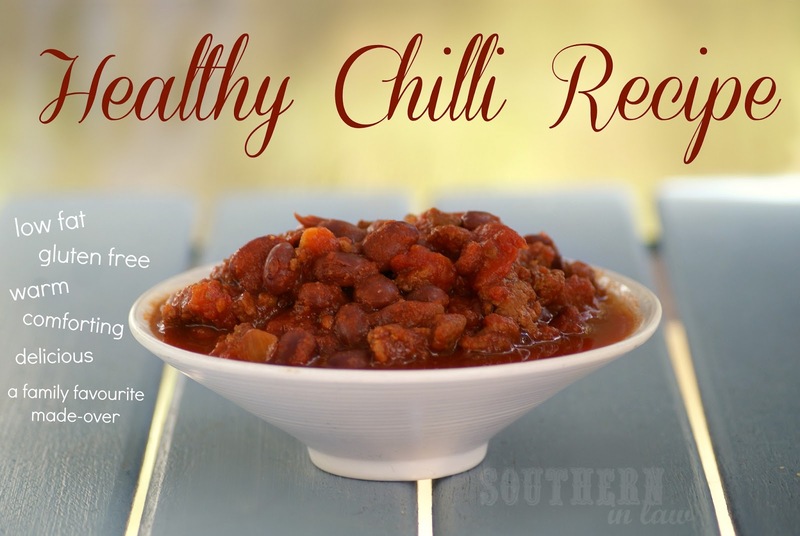 Serve it on rice, pasta, quinoa or with a hunk of healthy cornbread - the choice is yours! *I use either, depending on what's on sale at the grocery store or what we have in the fridge/freezer at the time. When I'm using turkey mince, I tend to add in the beef stock powder when browning off the mince to give it extra flavour. If you want to make a vegan/vegetarian version - simply switch the mince for a vegan/vegetarian alternative or leave it out all together, as well as the beef stock powder. So tell me, what's your favourite "healthy" dish? or what's something you'd like to see me do a healthy makeover on?